This is my desk at work. Can you guess what I do? It has absolutely nothing to do with sewing! Hmmm… I was going to say something involving working in a doctor’s office? I think that’s the best I can do…. I haven’t a clue…never saw such a thing! 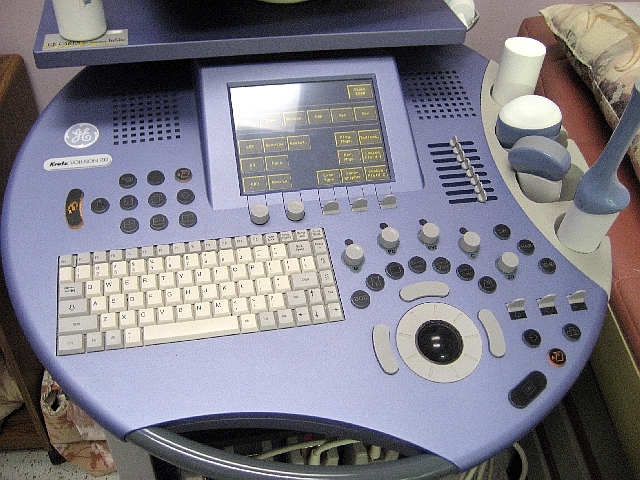 oh, wait a sec on closer inspection…is it an ultrasound machine? Are you a nurse or an ultrasound technician? You are a ‘Registered Diagnostic Medical Sonographer’. Okay I cheated I went to your profile and read it. Myself. I would have thought something to do with Star Wars or something!!! I am not going to read back and I’m going to say you RULE THE WORLD from that uh, desk. i saw those things on the right and i cringed remembering that stick one and what rolls over the top of it and what gets squeezed on it and where it goes and it brought back that feeling of losing my dignity, lol!!! i’ve had a few too many of those for my liking!!!! I think you work in a denisit office. Maybe you are the denisit. I’m guessing an X-ray Technician? Oh now my curiosity is killing me! I’m going with ultrasound technician? Maybe? Okay, So I know what you do and I know that you travel all over the place to do it. You are far more brave and gutsy than I could ever be! The more important question is…do the people who you are taking care of know what a kind, smart, creative, and slightly zany person you are? They are lucky to have you taking care of them. Yup definatley an ultrasound tech, I reconize those from my pregnant days with the twins, I got aquainted with my tech every week! Do you like your job? I have always been interested in that field…who knows maybe I can go back to school after the boys head off for kindergarden! looks like your a ultrasound tech! Wow. Do you travel and teach others how to operate this machine? I was thinking, though, if you brought 4 or 5 shades of fingernail polish you could really brighten that monster up! You know, give is an artsy-craftsy flair!